The sun has set quickly this evening in late March due to a heavy cloud cover in the sky. A driver cruises along at the 80 kilometers speed limit as her vehicle climbs a steep long hill. She is in good spirits on her way to a family celebration. The car is accelerating as it approaches the crest of the hill attempting to maintain speed. On the road just ahead, three dark bay mares stand blinded and momentarily paralyzed by the vehicle’s high beams. They bolt. In fractions of a second everyone’s life is changed forever. One horse lies dead on the shoulder of the road. Another is injured. A third horse escapes the mayhem. The driver lies critically injured in her van before being airlifted to a hospital trauma center. Her passenger miraculously is spared serious harm. A few days later the innocent and unsuspecting driver eventually succumbs to her injuries. She leaves behind a family and friends that will grieve her loss. The horse owner is riddled with guilt, shock and grieves too. This is a sad but true story. I know because I witnessed the aftermath and assisted police in securing the remaining two horses. Capturing injured and halterless horses in pitch blackness is a hazard in itself. Stumbling through a plowed field and quietly approaching these terrified horses with soothing voice and outstretch hands was difficult. Left to our own horse training experience, the police returned to the scene of the accident and kept traffic from approaching. A section of road was blocked off to oncoming traffic and rerouted. Even with precautions taken, these aimless horses could travel in any direction. Once again they could emerge on a busy lane precipitating more danger resulting in further possible fatalities. After several minutes of patient “walk and wait,” the horses were caught, haltered and led out. Back on the now deserted road, we made our way to the stationary police cruiser. The swirling emergency strobe lights had been extinguished, with only the hazard lights still operating. Upon cursory inspection of the injured mare using the police officer’s flashlight, it was evident that she required immediate medical treatment. My husband had to return to the farm and hook up our six horse van which was still in winter storage. I stood alone on the road for 40 minutes holding shanks on both horses waiting for his return. The injured mare stood quietly; head hung and eyes closed. The bolder mare fidgeted and circled, pawing the asphalt impatiently. Crackling voices emanated from the police radio. Lightning flashes from the officer’s camera documented the grotesque scene a short distance ahead. The deceased horse lay on the shoulder of the road. The shattered van of twisted steel and broken glass sat eerily silent and vacant as it straddled the road. The finality of it all radiated with every flash of the camera. The little Standardbred mare and her companion were transported back to our farm for emergency veterinary care and safekeeping that dreadful night. It was a cold night and an awful night to die. The popularity of 24 hour turnout of horses in rural areas and the economics of this seemingly affordable solution to keeping horses comes with an inherent high risk. It screams caution with insurmountable liability concerns and danger. As night falls and marauding predators begin their hunt, lack of secure stabling for horses or insufficient fencing, are all ingredients for a potential escape and tragedy. Statistics bear evidence to this problem in stark reality. In a British Columbia vital statistics report moose represent the most dangerous wildlife animal when it comes to motor vehicle collisions. In the domesticated animal population it is not surprisingly that the horse garnishes top ranking. Of the 47 horse related deaths studied in this report, 16 of those involved “unattended or riderless horses.” Rural areas represent the heaviest incident of collisions where speed limits exceed 60 km. It is almost double the urban rate for animal/vehicle fatalities and injury. In Great Britain the numbers of horse/traffic accidents is even greater. In 2000, 269 accidents involving horses were reported to the British Horse Society. Of that number, 49 horses were killed or destroyed while 98 other horses were maimed. Twenty-nine of those horses were loose at the time of the accident. Even with good fences horses can and will escape enclosures. No fence will hold a frightened horse whether it is chased by coyotes or spooked by a sudden crack in the bush surrounding it. Horse owners should be aware of the zoning requirements and in particular, the Line Fences Act when constructing fences to contain horses. Horses are considered livestock and therefore require appropriate fencing. Regulations may vary from province to province or state to state. In large expanses of pasture such as range land situations, regulations may also differ due to the exorbitant cost of fencing kilometers of hectares. Secondary parameter fencing is always an excellent idea should the initial enclosure fail to secure. Sometimes a gate is unintentionally left unlocked whether it is from distraction or sheer forgetfulness. At other times vandalism is the cause. Once on the run and in the cover of darkness, the horse becomes a lethal weapon both to itself and to motorists. In daylight hours a loose horse is more visible but still a danger because of its unpredictable nature and flight instincts. 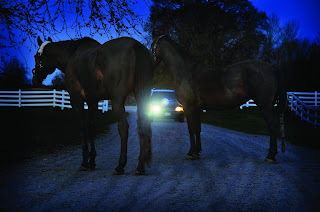 Reflective halters and leg bands are recommended for all nighttime pastured horses. Name tags on halters are also beneficial. Regular checks of fences, gates and barns are just good common sense practices. All boarding facilities, large or small, that offer pasture board are recommended to carry a sufficient liability insurance ($2 million) as well as Care and Custody insurance for animals under their supervision. In some jurisdictions it is a requirement by law. It should be one of your primary questions to ask before boarding your horse at any facility. Horse owners themselves and private farms should also be insured. A successful claim made against a horse owner can financially ruin that individual for life and possibly lead to prosecution as well. Even if a lawsuit is dismissed, the financial burden in participating in the legal action as well as the emotional trauma can take a serious toll on the horse owner. Still no amount of money can ever replace a human life or bring a wandering horse home again. 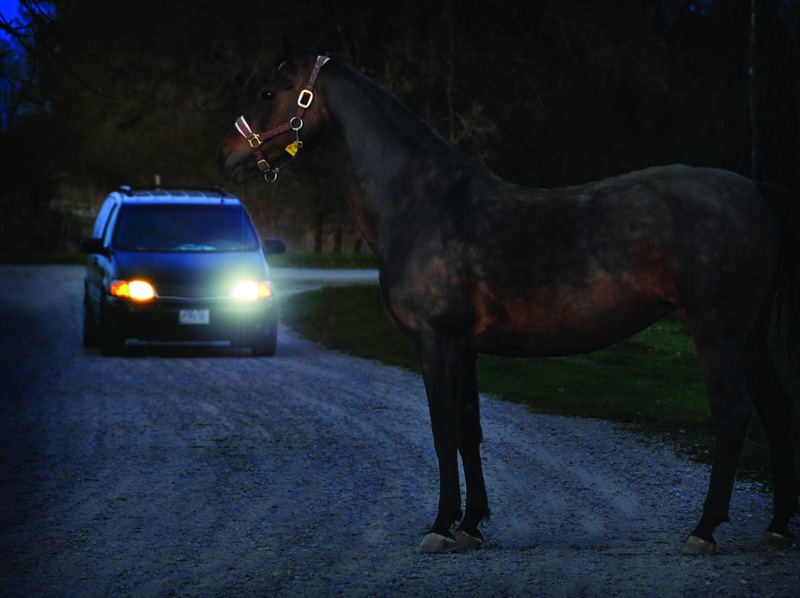 As keepers of the night it behooves all horse owners to protect their horses, the public and themselves from adding to the grim statistics that continue to shed concern on this problem. If you don’t think this could happen to you - think again. I’m sure no one in this story expected this to happen to them but it did.